Automatic tablet counter machine is an automatic version of the counting machine for tablets, capsules etc. While 2000 tablets per minute is the maximum output, it is supplied to companies with medium scale production runs. Due to it has been used for other applications so please ask about yours. First of all using the AC 2000 Automatic tablet counter machine product to be counted is placed in the hopper. Where it is vibrated onto a disc before being separated and dropping individually through an infra-red beam. Which accurately counts them into containers on a conveyor. So you can set the amount to be counted and the number of batches to be run on a touchscreen display. 4.6″ vertical touch screen capable of storing up to 50 recipes. Counts coated and uncoated tablets, hard and soft gelatine capsules and dragees. 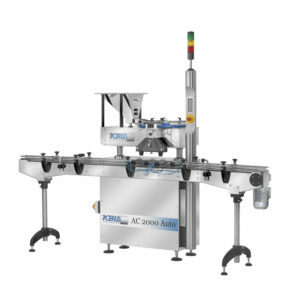 Integrate into a fully automated production line. Accurate dispensing with excellent repeat ability. First of all the automatic tablet counter machine is for counting Pills. Another use for the automatic tablet counter is counting caplets. Furthermore the automatic tablet counter can count sweets. Finally counting buttons is another use for the automatic tablet counter. Counting beads in addition is also a use for the automatic tablet counter. Unsure of the pill counter you require? but know the output that you would like to achieve. This chart gives estimated outputs for each pill counter. To help you get an idea of the tablet counting machine that fits your requirements. The output of each tablet counter will vary depending on the tablet size. Number of counts per container and the type of container.